As I walked into the Anaheim convention center, I quickly realized what everyone meant when they said Expo West is so big that it’s unexplainable. I was in shock at the number of enormous booths set up by brands. The booths weren’t just tables; they were beautiful, elaborate, multi-story, architectural structures that were designed to attract spectators, like myself, who become in awe of what the company and this industry can create. After months and months of planning for the big trip to Anaheim, I found Expo West to be a beast that only the very best can conquer. Knowing that there were 85,000 people attending and 3,500 brands marketing their products, makes the whole experience even harder to wrap my head around. No matter how much I had prepared for this experience, I could not fathom that reality. Walking the floor the first day, I focused on my mission and the reason I was there. I found this to be a very exhausting and a somewhat difficult task because the conversations I was having with my target brands felt forced. I was trying so hard to be the best professional business woman I could possibly be, yet soon found it the harder way to do Expo. The next day, I took a different approach by taking it much slower and by being much more sociable. I found that if I approached the brands in hopes of a nice conversation, the better response I received. I met so many great people on the floor and learned so much about the organic industry that I feel as though I had only been touching the surface prior to coming. 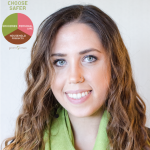 I like to think of myself as someone who eats healthy and lives a healthy lifestyle, but after attending Expo West, I learned that in order to live the most holistic life, we need to take actions that help support our planet as well. I was so impressed by the amount of people I talked to who have taken huge steps to lower greenhouse gas emissions and remove carcinogens from their products. This had a huge impact on me because the people I had these conversations with were very supportive of Protect Our Breasts and our future in the organic industry. Hearing from companies that they are both aligned with our mission and agreeing with what we are doing, truly inspires me to continue this path and bring change to consumers. One brand that particularly inspired me has yet to launch and will need to go through our vetting process for me to identify them as a safer alternative. However, after talking with the founders of this amazing brand, I felt so good about the future of our planet and all living things. They shared amazing values and life lessons with me that I will cherish forever. What I found so unique about this personal care brand was their mission to support sustainable organic agriculture that helps the environment and also gives consumers a safer beauty option. Their whole story really spoke to me and instilled in me that small actions can make a huge impact. This experience was one that I will never forget. It is hard to believe that I learned so much and that my whole perspective on healthy living has changed in just four days. Expo West and the awesome brands I spoke with gave me affirmation that taking small steps really can make a huge difference. 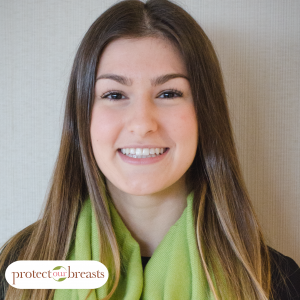 I am so proud to be doing my part in creating a safer world and am so lucky to be able to spread that mission to others through Protect Our Breasts.